Hundreds of species of carpenter bees exist across the world, all within the xylocopa genus. Infamously known for burrowing into wooden structures such as houses, different species of carpenter bees use materials such as plant stems, bricks, bamboo and lead-covered cables to build nests. Below are the most common types of carpenter bee species inhabiting different regions of the United States. This subgenus is primarily found in the American tropics, but can be spotted as far north as the southern portion of Virginia. 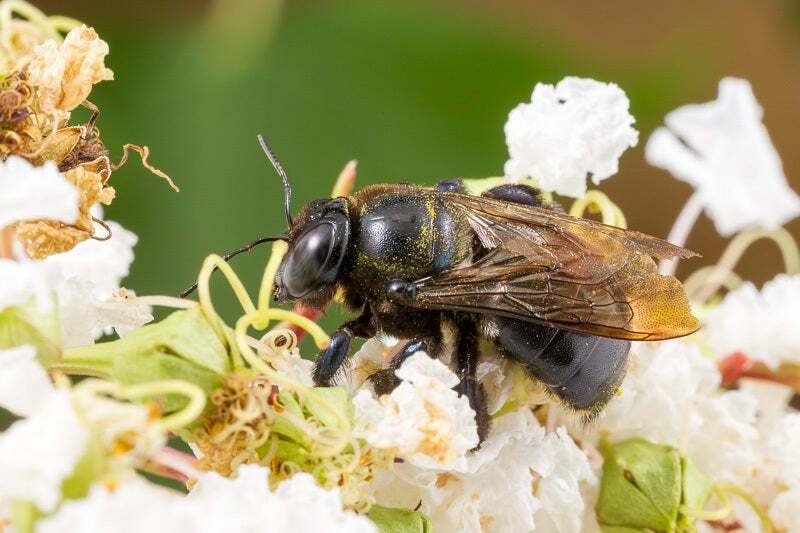 Commonly referred to as South Carpenter Bees, this species inhabits coastal lowlands and riparian wetlands. Occasionally, they are also found in the mountains. With a bright metallic exterior, these carpenter bees take nectar and pollen from a variety of flowers like azalea, hibiscus, and veronia. Luckily for homeowners, this species prefers natural environments over human-made structures. The mican carpenter bees live in and build their nests over the cold winter months. In April, new adults emerge from their nest for mating season, but each generation only lives for a year. Unlike the mican species, the virginica species can be found in almost half of the United States and into Canada, favoring climates east of the Rocky Mountains. The species favors structural timbers, including pine and cedar wood. Females are dominant and responsible for reproduction, foraging and nest construction. Males, on the other hand, are territorial defenders and exist solely to mate with females. Virginica feature a black, metallic body with a slight purple tint; males have a slightly longer body than the females and have white spots on their faces. The primary females are slightly larger than those that are considered secondary. The species is unique by the way the bees collect nectar. They have special maxillae (jawbones) designed to be more efficient than other carpenter bees. With a short life cycle, these carpenter bees mate in the early spring and lay eggs around July. In between, they create nests. After their eggs are laid, the bees die and the process begins again the following spring. The virginica are close siblings of the virginica texana (found in Kansas, Oklahoma and Texas) and virginica krombeni (southern Florida). Found primarily in Oregon, Nevada and Utah, this species has ten subspecies that are crepuscular (active at dawn or dusk), diurnal (active during the day) or matinal (active during morning hours). This species constructs their nests in dead native softwoods such as coffee plants, cottonwood, Douglas fir, incense cedar, Mexican pine, coast redwood and giant redwood. In the same subgenus as virginica, there are many similarities between this species and others. However, the californica species are a bit more metallic in appearance. This species makes their nests in soft, dry softwoods and visit a variety of natural flora and can be found in the southwestern United States, particularly Texas, New Mexico, Arizona, Southern California, Nevada and Utah. Varipuncta is found in western New Mexico, Arizona, Nevada, Utah and California and is occasionally referred to as the Valley Carpenter Bee. Instead of the metallic black of other carpenter bee species, males in this species tend to be more gold brown and fuzzy and have green eyes. The females, on the other hand, fit the more standard description of other carpenter bees. Unique to this species is the varipuncta’s ability to withstand both high and low temperatures by thermoregulating, the internal process by which they are able to maintain their core internal temperature. In the winter, young adult male and female bees hibernate in nests and emerge in the spring to clean the tunnels that traverse the nests. In addition to structural timbers, this species also looks for rotting or decaying wood in which to nest. This species, mainly found in the Hawaiian Islands, is said have arrived there through commerce between the islands and mainland United States going back as far as 1874. For many years, the sonoria were misidentified as varipuncta. However, unlike the varipuncta species, the sonoria prefer dry wood, not decaying or rotting wood. This is what makes them a threat to homeowners in the region. Due to the tropical climate, the species can lay eggs year-round. After the eggs are laid, the larva will hatch in two to three days and be mature over the course of six weeks. By now, hopefully you can spot a Carpenter Bee no what what region of the United States you reside in. Then, you protect your home or any wooden structure with a Best Bee Trap. To learn when to start preparing for carpenter bee season in your region, check out our Carpenter Bees by State page.